Key monsters and NPCs from the Reign of Winter Adventure Path come alive on your tabletop with the Reign of Winter Pawn Collection, featuring more than 100 creature pawns for use with the Pathfinder Roleplaying Game or any tabletop fantasy RPG! Printed on sturdy cardstock, each pawn presents a beautiful full-color image of a monster or NPC from the Reign of Winter campaign, including dragonkin, Russian soldiers, winter-touched fey, and dozens of unique NPCs also suitable for representing player characters. 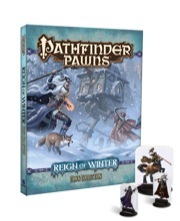 The Reign of Winter Pawn Collection, together with the creatures from Pathfinder Pawns: Bestiary Box and Bestiary 2 Box, provides pawns for nearly every Reign of Winter encounter. Each cardstock pawn slots into a size-appropriate plastic base from the Bestiary Box or Bestiary 2 Box, making the pawns easy to mix with traditional metal or plastic miniatures. With tons of distinct creature images, the Reign of Winter Pawn Collection brings to life the enemies and allies from all six adventures of the Reign of Winter Adventure Path. Another Quality Pawn Set for Your Frozen Wasteland! The Reign of Winter pawn set continues the tradition of well made pawns for your Pathfinder game. The artwork is gorgeous and the color on the pawns is vibrant. As with most adventure path pawn sets, you will need to supplement this with pawns from the Bestiary pawn sets, but that's always the case. If you're anything like me, you already have all of the generic sets and using them for your adventure is quite simple. Though the pawns we get are awesome, this collection is seriously missing a lot. None of the trolls, giant weasels, Wollipeds and even some unique characters are included, yet we get almost 6-7 baykok nuckleaves? I'm actually somewhat disappointed. Please have a Baba Yaga pawn! And a Dancing Hut!! The hordes demand it. I see a tiny Greta! Should a Pawns item for an AP be listed under the PF RPG? Why does this come out after the AP? Wouldn't it be better to have it available to use when playing or does everyone else wait till all the parts of an AP come out to play it? If I remember correctly I believe someone said that they don't get all of the art for the pawns until after the AP is finished or atleast the art from the last issue of the path. It would be nice if it came out at the same time as the AP. Not sure how their schedule works for each path. Don't know if they work on each part consecutively or one waits till the previous part is completed before they start on the next one. Yep, any product that relies on art like Pawns or the map packs generally waits until the end of the release so that the Art actually exists. Although yes, many people do wait until the last issue of an AP is out so that they can work elements and themes from later parts into the story earlier. As the others have said, the pawns for an Adventure Path use a lot of art from the Adventure Path, which means we don't have all of the art until the last volume of the AP is finished. Then of course, we have to actually choose what pawns will be included, order new art for important pawns that didn't get illustrated in the AP, and then go through the whole printing process, which is more complicated than just printing a book. All of which ends up with a pawn set that comes out after the AP, unfortunately. If I ran APs I'd probably just always do them 6 month after release. Sure I'd always be one full AP arch behind but that way I could run them with all the supplemental materials. This set could almost be a box set itself with the wide range of characters in the AP. Irrisen witches, centaurs, asst. fey, Triaxian elves, drakes and dragon-kin, Russian soldiers, not to mention Baba Yaga, Rasputin, and the Dancing Hut! There are most definitely frost giants in this set! Updated product image and description to final. I'd not rule out a Queen Elvanna or a Baba Yaga, in the Legends set. Of course, I'm just some guy, so take that for what it's worth. Shattered Star got miniatures before Skull and Shackles. Though the very different nature of the monsters helped Skull and Shackles get a set. That's one of the things that I thought was cool with Reign of Winter— all the winter and winter-touched creatures (and WWI stuff). Maybe they feel it won't have a general appeal to people just buying minis to use with their campaigns. I keep trying to stick my fingers into the pipe to clean out the gunk, so I can see farther down, but it ain't working. LOL. Still all these late dates for pawns/minis for Reign of Winter is making me sad that I chose it to begin playing Pathfinder with my boys (loved the theme and color scheme too much to pass up). Oh wow, I hope this means we'll get getting a Reign of Winter set ! Your white dragon evolution stuff was helpful up until now. I have to say this is one of the most fun adventure paths I've played. There's tons of detail on Irrisen and Whitethrone and I'm having a blast. I really want a Nadya Petska mini and of course we really really want a scale model of the dancing hut. That would be amazing. Because I'm using the dreamblade mini right now but the scale is off. It would be really cool if the top came off and you could put inside 25mm minis.... just saying... that would be a collectors item from the planes, surely ! Product description updated, set list added. Which of all these critters got new artwork? Is this running late now, I haven't seen it released anywhere? Street date is October 30, so still another ten days until shops can sell it. I thought (and I accept that I may be wrong) that the pdf date is after the hard-copy date. But either way, thanks. Nope, PDF date is usually the street date of the item, that way people can buy the PDF the same day as the hard copy. Does this mean they don't plan to release a paper minis set for anything more than Snows of Summer? I'm halfway through that adventure, and I'm getting to love those little guys. I could probably love these too, it just requires a greater investment. The paper minis are not actually released by Paizo – they are third party products under a special license. You will also notice that full sets of paper minis exist both for Rise of the Runelords and Skull & Shackles – i.e. the adventure paths with releases of Pathfinder Pawns. So, I think, it is safe to assume that more paper minis for Reign of Winter will be forthcoming. Do these come with bases or not? It's unclear from the description, but it sure sounds like they don't and you have to get the bestiary box to get bases. I would love to get these to fill in the gaps for my reign of winter campaign, but if i also have to get the bestiary box, that might be a little too much for my tender wallet. None of the pawn collections come with bases - you are meant to supplement with those found in any of the other boxes. *Ok, we do sometimes—say, if there's a need for a lot more of a particular monster, or if there's specific artwork for the monster in question for the AP, or so on. Where's the animated Ice dragon from the first book? It's impossible, for a variety of reasons, to make a pawn for every creature in the AP, and as such, we have to make difficult choices about who gets a pawn and who doesn't. In the case of the animated ice dragon, I decided that the Large white dragon pawn from the Bestiary Box set would be a good match. As a result, something else from the AP got a pawn that otherwise wouldn't (such as the dragonkin from Pathfinder #70). As for the regular monsters, I've got tons of "normal" monster minis running around. I just thought it would be cool to get the specific ones for the AP. Pretty nice pawn set, there were couple of pawns that were missing that I would have liked to see in there, one of biggest was pawn for Nostafa from book 3 or even basic night hag pawn for her since even bestiary box only had pawn for green hag. Second one being Korred pawns as adventure path requires 6 and there are none here and bestiary box 2 only had 1 in it. Disappointing set... too many pawns from the AP missing... I mean seriously, how could you not include Teb? and I probably will have to put large elemental pawns into huge bases. Please provide huge elementals of each type in some future pawn set. Pretty please. The Huge Elementals are in the Monster Summoner pawn set. So they are, although only the four base elementals. Well, I'll have to look into getting that one, lots of useful stuff in there.